Know you’re getting a superior clean* with the Oral-B Genius 9000 electric toothbrush. This highly advanced brush features a dentist-inspired round head that surrounds and cups each tooth with dynamic oscillating, rotating and pulsating movements to remove up to 100% more plaque than a regular manual toothbrush. 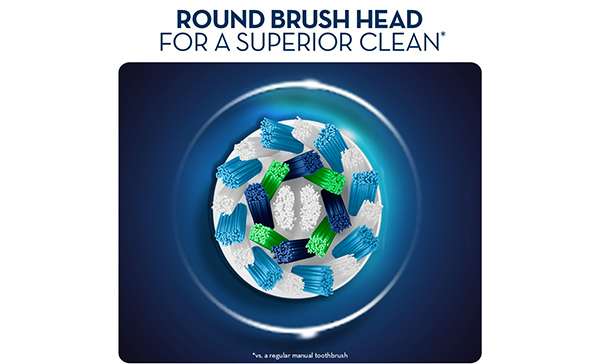 Oral-B replacement brush heads feature a professionally-inspired design that surrounds each tooth. The dynamic movement of 3D cleaning action helps the brush head adapt to your teeth as it oscillates, rotates, and pulsates to break up and remove up to 100 per cent more plaque than a regular manual toothbrush. Oral B Genius Gold Sakura Limited Edition Toothbrush is rated 4.8 out of 5 by 13. Rated 5 out of 5 by Ames from Great toothbrush! Extremely versatile and affective toothbrush, highly recommended! Rated 5 out of 5 by Lazarus from High quality and user friendly For the top of the range product, it's great value as it's not that much more in cost. Has all the features you need and user friendly. Teeth feels cleaner and battery life is very good compared to the older ones. Great accessories such as travel case with charger and phone holder for when you use the Oral B app. Rated 5 out of 5 by Vixstar from Helpful & great features I bought this for my birthday a few weeks ago & I absolutely love it so much . My teeth feel so much more cleaner & I love the app as it tells if you are brushing well...So happy I invested in this product. I am not interested in all the IT Bluetooth functions - can I just use it as normal electric toothbrush? Does the Genius 9000 electric toothbrush come with a regular charger for main power other than the dual charge case ?